fDepartment of Radiology (M.R., H.-P.S., A.R. ), German Cancer Research Center, Heidelberg, Germany. aFrom the Departments of Neuroradiology (P.K., S.H., M.B., A.R. )fDepartment of Radiology (M.R., H.-P.S., A.R. ), German Cancer Research Center, Heidelberg, Germany. BACKGROUND AND PURPOSE: Dynamic contrast-enhanced MR imaging can provide in vivo assessment of the microvasculature in intracranial tumors. The aim of the present study was to evaluate the diagnostic performance of dynamic contrast-enhanced MR imaging derived vascular permeability parameters, including the volume transfer constant, the volume of extravascular extracellular space, and the flux rate constant between the extravascular extracellular space and plasma, for the differentiation of primary CNS lymphoma and glioblastoma. MATERIALS AND METHODS: Sixty glioblastomas and 11 primary central nervous system lymphomas were included. Pretreatment T1-weighted dynamic contrast-enhanced MR imaging with a 3D T1-weighted spoiled gradient-echo sequence was performed on a 3T MR imaging scanner. Perfusion parameters (volume transfer constant, the volume of extravascular extracellular space, and the flux rate constant) were measured on the basis of the Tofts-Kernmode model. The Mann-Whitney U test and receiver operating characteristic analysis were used to compare those parameters between primary central nervous system lymphoma and glioblastoma. Histopathologic correlation of dynamic contrast-enhanced MR imaging findings was performed by using reticulin staining and CD31 immunohistochemistry. RESULTS: Median volume transfer constant and flux rate constant values were significantly higher in primary central nervous system lymphoma (0.145 ± 0.057 and 0.396 ± 0.088) than in glioblastoma (0.064 ± 0.021 and 0.230 ± 0.058) (P < .001, respectively). Median volume of extravascular extracellular space values did not differ significantly between primary central nervous system lymphoma (0.434 ± 0.165) and glioblastoma (0.319 ± 0.107). On receiver operating characteristic analysis, volume transfer constant had the best discriminative value for differentiating primary central nervous system lymphoma and glioblastoma (threshold, 0.093; sensitivity, 90.9%; specificity, 95.0%). Histopathologic evaluation revealed intact vascular integrity in glioblastoma despite endothelial proliferation, whereas primary central nervous system lymphoma demonstrated destroyed vessel architecture, thereby promoting vascular disintegrity. CONCLUSIONS: Primary central nervous system lymphoma demonstrated significantly higher volume transfer constant and flux rate constant values compared with glioblastoma, implying a higher vascular permeability in primary central nervous system lymphoma. These findings confirm initial observations from perfusion CT and dynamic contrast-enhanced MR imaging studies, correlating with underlying histopathologic features, and may be useful in distinguishing primary central nervous system lymphoma from glioblastoma. Distinct structural and ultrastructural differences in the microenvironment of the tumor vasculature on histologic assessment have been reported for PCNSL and GB, suggesting increased vascular permeability for PCNSL.11 However, radiologic comparison of vascular permeability in PCNSL and GB has as yet only been performed with perfusion CT12,13 or with DSC-PWI processed with a mathematic leakage-correction model,14 which, in part, confirmed the increased vascular permeability for PCNSL. The aim of our study was to evaluate the diagnostic performance of DCE-MR imaging–derived vascular permeability parameters, including Ktrans, Kep, and Ve for the preoperative differentiation of PCNSL and GB. Furthermore, histopathologic correlation of DCE-MR imaging findings was performed for all patients by using reticulin and CD31 immunohistochemistry. Our institutional review board approved this retrospective study, and the requirement for patient informed consent was waived. Potentially eligible patients from October 2009 to June 2013 were identified on the basis of the diagnosis of PCNSL or GB. Next, for the selection of appropriate patients with PCNSL, only previously untreated, immunocompetent candidates were included. Thereby, 11 patients with PCNSLs with available DCE-MR imaging data on pretreatment MR imaging were available for inclusion in the present study. For selection of appropriate patients with GB, similar inclusion criteria were used. In detail, only previously untreated patients with the availability of pretreatment DCE-MR imaging data were included. Thereby, a control sample of 60 patients with GB was selected for inclusion in the present study. Images were acquired in the routine clinical work-up by using a 3T MR imaging system (Magnetom Verio/Trio Tim; Siemens, Erlangen, Germany) with a 12-channel head-matrix coil. Axial DCE-MR imaging was performed with a 3D spoiled gradient-echo sequence providing coverage of the entire brain by using the following parameters: matrix size, 128 × 128; FOV, 172 × 230 mm; TR, 5.28 ms; TE, 2.45 ms; flip angle, 10°; section thickness, 5 mm. Thereby, 22 dynamic acquisitions, each including 26 sections, were obtained every 13.34 seconds, resulting in a total measurement time of 4:53 minutes. After the third dynamic acquisition, a standard dose (0.1 mmol/kg body weight) of gadoterate meglumine (Dotarem; Guerbet, Aulnay-sous-Bois, France) was injected as a bolus through a pneumatically driven injection pump at an injection rate of 5 mL/s. After completion of the DCE-MR imaging sequence, standard postcontrast MPRAGE data were acquired with TI = 1100 ms, TE = 4 ms, TR = 1710 ms, and flip angle = 15°. Postprocessing of DCE-MR imaging data was performed with dedicated postprocessing software (Tissue 4D; Siemens) based on the Tofts-Kermode model.9 First, motion correction was performed on the dynamic images on the basis of an elastic 3D registration technique. Signal intensity was then converted to gadoterate meglumine concentration, and the time–signal intensity curve was calculated. A value for the arterial input function was determined automatically on the basis of a mathematic simulation as described by Orton et al.15 After obtaining a kinetic modeling parameter map, a radiologist who was blinded to the patient's histology placed freehand ROIs within the entire contrast-enhancing tumor on each section of the DCE-MR images. Cystic or necrotic regions and normal vessels were avoided during region-of-interest placement. Following delineation of the entire contrast-enhancing tumor, vascular permeability parameters (Ktrans, Kep, and Ve) were automatically generated on the basis of the pixel information from all placed freehand ROIs. To assess whether DCE-MR imaging–derived vascular permeability parameters correlate with vascular integrity on histopathology, we performed reticulin (Tibor-Pap) and hematoxylin-eosin (HE) staining of formalin-fixed paraffin-embedded tumor tissue for all patients. Thereby, both HE and Tibor-Pap stains were used to illustrate the architecture of the tumor and vessels, whereas Tibor-Pap highlights the reticulin fibers in the outer border of the vessel wall, which may be destroyed and detached from the inner endothelium membrane in case of decreased vascular integrity.16 Additionally, in cases in which the endothelial architecture was not evident from HE and reticulin staining, CD31 immunohistochemistry, highlighting endothelial cells, was performed. Tissue was provided by the Department of Neuropathology, Institute of Pathology, University of Heidelberg Medical Center, Germany, in accordance with local ethics approval. Sections cut to 3 μm were processed by using a BenchMark XT immunostainer (Ventana Medical Systems, Tucson, Arizona). Reticulin and HE staining was performed by applying standard protocols. Pretreatment for antigen retrieval was followed by incubation with antihuman CD31 antibody (Dako, Glostrup, Denmark). Incubation was followed by Ventana standard signal amplification, UltraWash, counter-staining with 1 drop of hematoxylin for 4 minutes and 1 drop of bluing reagent for 4 minutes. For visualization, the UltraView Universal DAB Detection Kit (Ventana Medical Systems) was used. Reticulin, HE, and CD31 stains were analyzed by a neuropathologist by using a Olympus BX-50 microscope (Olympus America, Lake Success, New York), and vascular integrity was rated as intact or decreased. Statistical analysis was performed by using the Statistical Package for the Social Sciences Statistics, Version 20.0 (IBM, Armonk, New York). 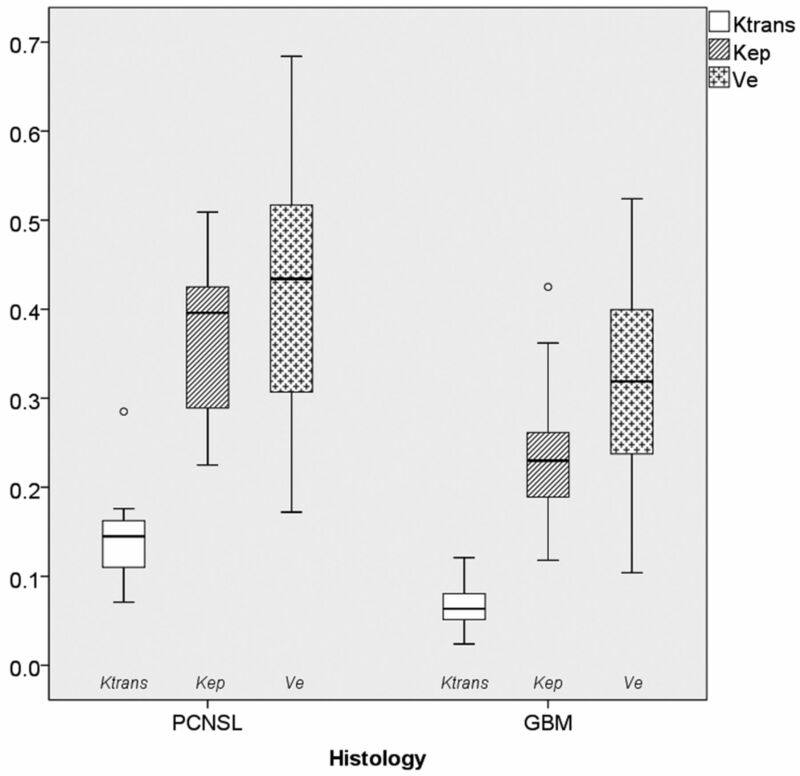 A Mann-Whitney U test was used to compare vascular permeability parameters (Ktrans, Kep, and Ve) between PCNSL and GB. Receiver operating characteristic analysis was performed to determine the optimum thresholds for discrimination of PCNSL and GB. P values < .05 were considered significant. Figure 1 shows a boxplot of DCE-MR imaging–derived vascular permeability parameters, including Ktrans, Kep, and Ve. Median Ktrans values were higher in PCNSL (0.145 ± 0.057; 95% CI, 0.106–0.183; range, 0.071–0.285) than in GB (0.064 ± 0.021; 95% CI, 0.060–0.071; range, 0.024–0.121) (P < .001). Similarly, median Kep values were higher in PCNSL (0.396 ± 0.088; 95% CI, 0.305–0.423; range, 0.225–0.509) than in GB (0.230 ± 0.058; 95% CI, 0.215–0.245; range, 0.118–0.425) (P < .001). Median Ve values did not differ significantly between PCNSL (0.434 ± 0.165; 95% CI, 0.311–0.534; range, 0.172–0.684) and GB (0.319 ± 0.107; 95% CI, 0.292–0.347; range, 0.104–0.524). On receiver operating characteristic analysis, Ktrans had the best discriminative value for differentiating PCNSL and GB (area under the curve, 95.6%; threshold, 0.093; sensitivity, 90.9%; specificity, 95.0%) compared with Kep (area under the curve, 89.1%; threshold, 0.272; sensitivity, 90.9%; specificity; 78.3%) or Ve (area under the curve, 68.6%; threshold, 0.410; sensitivity, 63.6%; specificity, 76.7%). The workflow of postprocessing DCE-MR imaging data of 2 representative patients with PCNSL and GB is shown in Fig 2. Boxplots of microvascular permeability parameters in primary CNS lymphoma and glioblastoma, including the volume transfer constant (minute−1), the volume of extravascular extracellular space per volume unit of tissue, and the flux rate constant between extravascular extracellular space and plasma (minute−1). The solid line inside the box represents the median value, while the edges represent the 25th and 75th percentiles. The straight line (bar) on each box indicates the range of data distribution. Circles represent outliers (values >1.5 box length from the 75th and 25th percentile). Tissue concentration of contrast agent after bolus injection of 0.1 mmol/g of gadoterate meglumine (left column) in primary CNS lymphoma (upper row) and glioblastoma (lower row). 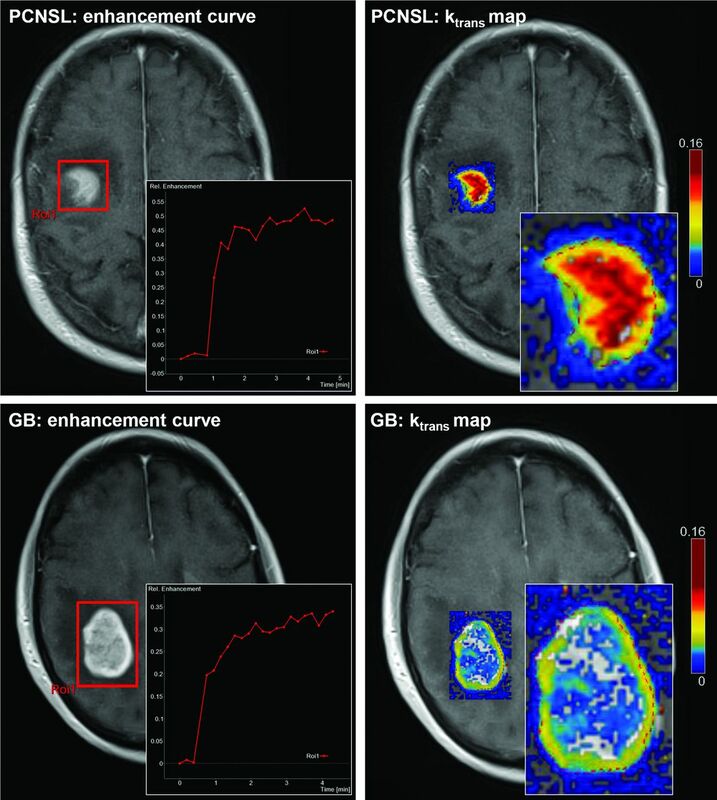 Note the differences in the relative enhancement curve within the region of interest, encompassing the tumor (red square), which peaks at 0.53 in PCNSL and at 0.34 in GB. Perfusion parameters from kinetic modeling parameter maps (right column) were measured by using freehand region-of-interest placement within the solid part of the entire contrast-enhancing tumor (dashed red line within the zoomed kinetic maps; only 1 section is shown here). In these samples, median Ktrans values were 0.147 ± 0.031 for PCNSL and 0.045 ± 0.014 for GB. On histopathologic assessment of vascular integrity, tissue samples from PCNSL demonstrated destroyed vessel architecture in each case. Thereby, the outer border of the vessel wall was infiltrated by tumor cells (ie, angiocentric growth pattern), destroyed, and detached from the inner endothelial membrane, thereby contributing to vascular disintegrity (Fig 3, left column). In contrast, vascular integrity was rated as intact for all GBs (Fig 3, right column). 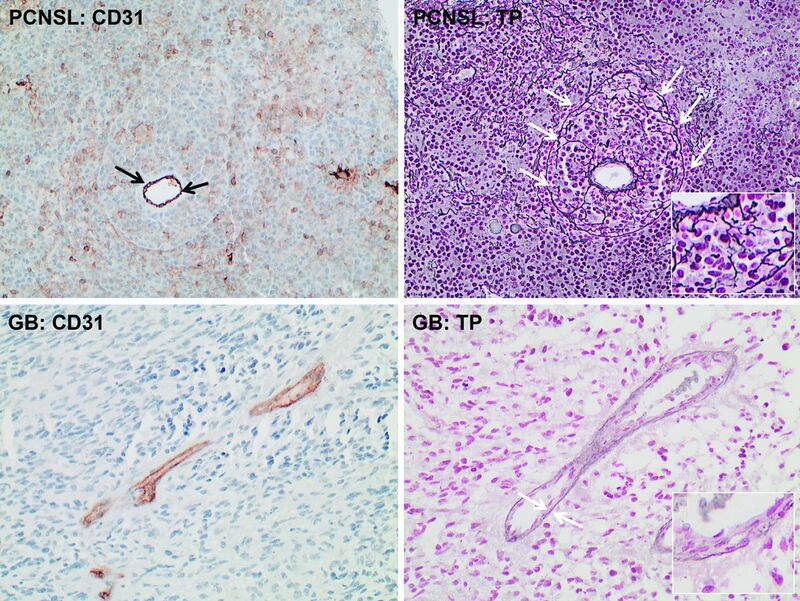 Histopathologic assessment of vascular integrity from those patients shown in Fig 2 (original magnification ×200 for all stains): Immunohistochemistry for CD31 (left column) highlights endothelium in primary CNS lymphoma (PCNSL) (upper row) and glioblastoma (GB) tissue (lower row). Black arrows point to the endothelium and indicate the actual lumen of the vessel in PCNSL tissue. In contrast, white arrows in the reticulin staining of the PCNSL tissue (upper row, right) illustrate the outer border of the vessel wall, which is infiltrated by tumor cells, destroyed, and detached from the inner endothelial membrane and thus contributing to decreased vascular integrity. White arrows in the reticulin staining of the GB tissue (lower row, right) underline the integer basal membrane of vessels despite endothelial proliferation. The present study evaluated the diagnostic performance of DCE-MR imaging–derived vascular permeability parameters to facilitate the preoperative differentiation of PCNSL and GB. As a principal finding, our study shows that PCNSL demonstrates significantly higher Ktrans and Kep values on DCE-MR imaging compared with GB, thereby implying a greater degree of BBB disruption and thus higher vascular permeability in PCNSL, ultimately confirming initial observations from perfusion CT and DSC-MR imaging studies.13,14 Furthermore, we could demonstrate that these findings correlate with underlying histopathologic features, with intact vascular integrity for GB and destroyed vessel architecture in PCNSL, thereby promoting vascular disintegrity in the latter group. Furthermore, the DSC-PWI leakage-correction model assumes that the contrast agent arrives at the same time in the tumor and unaffected normal brain tissue and that tumor and nontumor tissue have equal MTT.25,26 However, tumor vasculature is extremely variable and heterogeneous,27 and elevated tumor MTT may cause overestimation of CBV and underestimation of K2.22,26 Therefore, Bjornerud et al26 recently described a novel leakage-correction algorithm for evaluating microvascular permeability on DSC-PWI that is insensitive to MTT. However, the clinical value of such mathematically leakage-corrected DSC-PWI permeability parameters has to be determined in future studies and correlated with those from DCE-MR imaging. Previous studies have demonstrated that CBV values significantly differ between PCNSL and GB, with only modest increased values in the former and markedly increased values in the latter group.14,28⇓–30 These results may be explained by the differences in neovascularization, which is a hallmark in GB,31 however, an unusual feature in (non-AIDS-related) PCNSL.32 Thus, the microvascular blood flow to the tumor tissue in GB is often hampered by an abnormal tumor vasculature due to neovascularization comprising immature or defective endothelium, tortuosity, and thrombosis. Hence, the uptake of contrast agent by the GB tissue is likely limited by blood flow.10 In contrast, the absence of neovascularization and the substantial disruption of the BBB in PCNSL is related to the clustering of tumor cells within and around pre-existing brain vessels (ie, angiocentric growth pattern).33 These distinct morphologic differences may make the uptake of contrast agent in PCNSL less flow-limited compared with GB, which may serve as an explanation for the significantly higher Ktrans and Kep values in PCNSL in the present study. A potential limitation of the present study is that due to the given section thickness of the DCE-MR imaging sequence, volume-averaging effects may have limited exact region-of-interest placement for precise delineation of the contrast-enhancing tumor. Another limitation is that DCE-MR imaging–derived vascular permeability parameters may be affected by several factors, including blood flow; blood volume; endothelial permeability; endothelial permeability surface area; and hydrostatic, interstitial, and osmotic gradients across the endothelium.10 Thus, we could not definitely state whether changes in Ktrans and Kep were solely due to changes in vascular permeability or to what extent other factors may have contributed. PCNSL demonstrated significantly higher Ktrans and Kep values compared with GB, thereby implying a higher vascular permeability in PCNSL. These findings correlate with underlying histopathologic features, with intact vascular integrity for GB and destroyed vessel architecture in PCNSL, thereby promoting vascular disintegrity in the latter group, and they may improve the preoperative differentiation of PCNSL and GB. Disclosures: Heinz-Peter Schlemmer—UNRELATED: Consultancy: Siemens, Grants/Grants Pending: Siemens,* Payment for Lectures (including service on Speakers Bureaus): Siemens, Curagita, Covidien; Travel/Accommodations/Meeting Expenses Unrelated to Activities Listed: Siemens. Wolfgang Wick—UNRELATED: Consultancy: Roche, Merck Sharp & Dohme, Payment for Lectures (including service on Speakers Bureaus): Roche, Prime Oncology, Patents (planned, pending or issued): IDH diagnostic antibody. Martin Bendszus—UNRELATED: Board Membership: Vascular Dynamics, Payment for Lectures (including service on Speakers Bureaus): Novartis, Roche, Codman, Guerbet. *Money paid to the institution. Paper previously presented at: European Congress of Radiology, March 6–10, 2014; Vienna, Austria.